Oops. This totally wasn’t meant to be a rant about the weather. But once we’re on the topic, how crazy is it that in a span of a couple of days, I went from sweatshirts and shivering to how-high-does-the-AC-in-this-car-go. It’s a pain trying to get dressed for the day when you have to remember that there’s a 25 degree fluctuation possible. But anyway. Back to cookies. Pretty cookies, to be specific. So as we said, these are pretty colors. Did I mention how sparkly these are? Ok, I am definitely not the sparkly-unicorn-girly type, but sparkly cookies kinda make anyone smile, am I right or am I right? Anyway, once you get past the whole exclaiming over how pretty these cookies are, you bite into them and the soft, cake-y deliciousness will totally amaze you. And you’ll totally reach for another one, but don’t feel bad. Nobody can resist these. In the bowl of an electric mixer, beat together the butter/margarine and sugar until creamy. Add the lemon zest, lemon extract, vanilla extract, baking powder, lemon juice and food coloring. Beat until combined. Add the eggs, one at a time, beating well to combine after each addition. Beat until creamy. Add the flour and beat until just combined. Place the yellow sugar in a small bowl. Using a small cookie scoop, scoop a ball of dough into the sugar, then roll it between your palms to smooth it out. Place on the prepared tray. Repeat with the remaining dough, leaving plenty of room for spreading. Bake the cookies at 350 for 8 minutes. Remove from oven and set aside to cool completely. To make the filling: beat together the butter/margarine and cream cheese until smooth. Add the remaining ingredients and beat until smooth and creamy. Sandwich the filling between two cooled cookies. *Note: if you don’t have yellow sugar, don’t skip it. You need it for the texture of the cookies. You can roll them in plain sugar though – it will only affect the looks (a bit!). OMG come to my mouth right now! You can complain about the weather as much as you like, Miriam! We here in Vancouver do it ALL.THE.TIME. We’re chronically depressed because all it does here is rain. These gorgeous, bright, adorable cookies would totally brighten my mood though. I can just imagine how wonderful these taste! Cute and yummy! I love yellow and pink together. These look so pretty they make me want to break my diet. The pictures are sooo pretty. 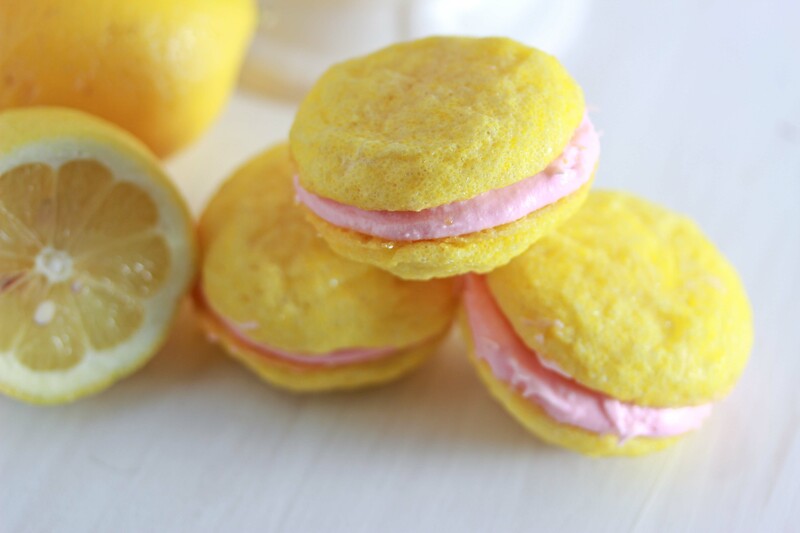 I just made a cookie with similar flavors- lemon raspberry. Yours look delicious! Beautiful photos too! Oh my! I’m getting hungry looking at this…Must-try!! 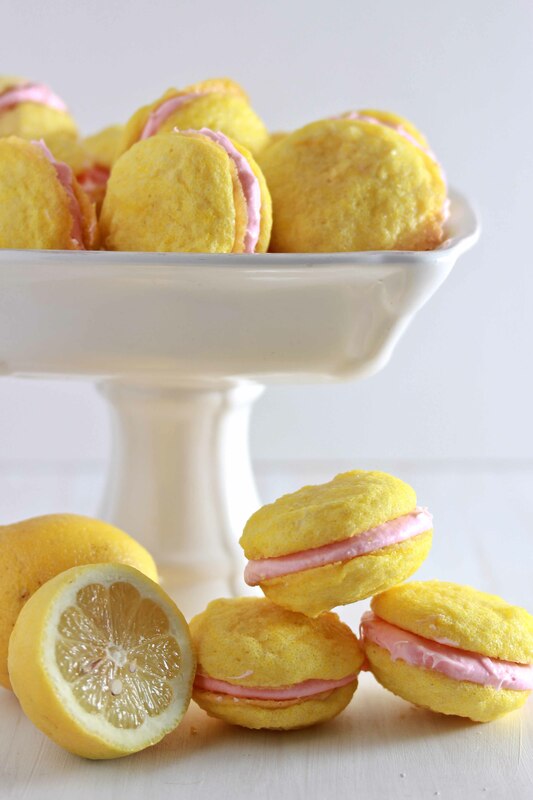 These strawberry lemonade sandwich cookies are just too adorable.com!! These cookies look beautiful. I made them for a baby party, the taste was a bit too sweet for me. They were also very crumbly in texture, and would crumble in my hands. The filling should have been stiffer, but adding confectioner’s sugar would make a too sweet filling even sweeter. 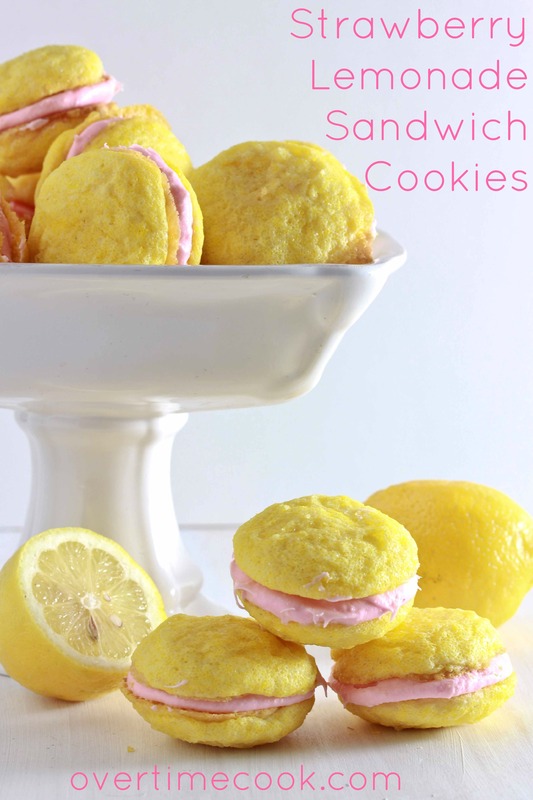 For the yellow sugar in this recipe, I just used some yellow food coloring to dye regular granulated sugar, it clumps at first, but using a fork to mix it it will break up the clumps and dye all the sugar.